Problem #1: The circuit breaker for the outlet has tripped. A tripped breaker is a common reason why your outlet may have stopped working. The Solution: Head over to your electric panel and put the breaker back to the “On” position. Sometimes a breaker may not clearly look like it’s off, but it could be – so make sure the breaker that the outlet in question is on is completely in the “On” position. If you are continually having a problem with that outlet because of the circuit, you may need to call an electrician in to help solve that problem. Problem #2: The outlet is faulty. As homes age, so does their electrical wiring, and with aging comes the possibility of an outlet failing. There’s no real problem here – a faulty outlet may just be the result of being old. The Solution: Your outlet will need to be replaced in order to work properly. We recommend having an electrician handle this one due to this risk of shock, fire, and injury or even death if done improperly. Problem #3: A GFCI outlet has tripped. You’re probably familiar with GFCI outlets – they are commonly located in kitchens, bathrooms, garages, or near water. This is for safety reasons and due to building codes. Instead of turning off the breaker when these outlets short, they instead turn the outlet off. Here’s the thing about GFCI outlets: they can cause other outlets that are on the same circuit to shut down also if they detect a problem. The Solution: The solution for this one is pretty easy. A GFCI outlet has two buttons on it. One is labeled “Test” and the other is labeled “Reset.” To reset the outlet, press the “Reset” button, and this should restore power to the outlet. If that does not restore the power, there may be a bigger problem that requires an electrician. Keep in mind that GFCI outlets on the same circuit may all need to be reset. Information from Angie’s List. If your outlet doesn’t work, the first thing to check is your breaker unless it is a GFCI outlet. If it’s a GFCI outlet, try to reset the outlet. If it’s not your breaker and not a GFCI outlet, the outlet may need to be replaced. 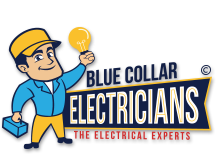 It is best to bring in an experienced electrician like the electricians at Blue Collar Electricians.